The final push to evict the Runway 2 protesters came in the early hours of Monday morning. Bailiffs removed the occupants of the tree house known as "Battlestar Galactica", using a heavy hydraulic platform. The use of the crane was criticised, because of the danger to tunnellers, but the Under-Sherriff said he feared for the safety of the tree dwellers in the strong wind and decided to use the crane. One of those brought back to earth was a woman who had locked her arm in a drum filled with concrete. Bailiffs on the ground used a pneumatic drill to set her free. The last of the tree top protesters were removed on Wednesday, when only 8 protesters remained under the ground. At the time of writing, four were still holding out in the "Cake Hole" tunnel, with supplies for at least another week. The Under-Sherriff's men are digging their own tunnels to reach the protesters, who have now broken the record for staying under the ground, set by Swampy, alias Daniel Hooper at the A30 site in Devon. In the city centre, a group of people who had been evicted from the Flywood camp staged a demonstration at the annual meeting of AMEC, joint contractors of the second runway with Tarmac. By purchasing just one share in the company, five protesters, one dressed as a badger, gained access to the meeting, held at GMEX, and proceeded to cause disruption. After being ejected, they said they had wanted to raise questions about the environmental damage the runway will cause. Then a group of them then climbed onto the roof of GMEX and unfurled a banner saying "Air pollution kills". A fire was still raging in the Peak District near Glossop on Monday. Firefighters used appliances and helicopters to try to put out the blaze, which may well have been started by careless visitors. The fire was put out later in the week. Parents at £4300 a year Manchester Grammar School are planning to set up a scheme to enable pupils from less well off backgrounds to attend the school. The Labour Party will abolish the assisted places scheme, which gave money to parents to send their children to private schools. Cine City Withington is back in operation again. The cinema, closed down by its previous owner, was bought up by a film buff and refurbished. The three screens opened again on Friday the 30th of May. Oldham residents were outraged at a proposal by the local council to put up a plaque on a house in Brompton Street, where the notorious Lord Haw Haw spent some time as a child. William Joyce had Irish origins, but went over to the Nazis during the war. His sneering broadcasts, always commencing "Germany calling, Germany calling" became familiar to British listeners, as he told them they would lose the war. At the end of the war, Joyce was tried and hanged. Councillors are suggesting that such a plaque isn't necessarily a tribute, but local people disagree. Plaques in honour of local born entertainers Eric Sykes and Dora Bryan are also being considered. 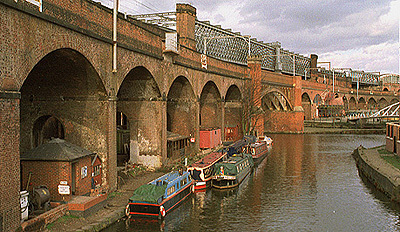 It's been a vegetarian weekend on two wheels for some in Manchester, as "Vegfest 1997" celebrating "the future of food" was held this weekend at Castlefield. The event ran in tandem with a cycling festival, where people were urged to use bikes instead of cars and buses. Cheap second-hand bikes were available at auction. And in a marquee by the canal dock, vegetarian leaflets and displays urged people to give up meat and fish. The veggies and vegans weren't getting all the publicity though. On Upper Brook Street, a billboard ad, showing a large pork chop, celebrated the nutritional attractions of meat. The new Lonely Planet guide was published on Thursday, and has some interesting things to say about Manchester: "The streets are dominated by empty warehouses and factories, the fantastical grandeur of Victorian gothic buildings, rusting train tracks and motorway overpasses". There are some good points though: "Underneath the unprepossessing skin... there's plenty of life. The less time you have, the lower your chances of finding it, but it's there, especially at night in the clubs and pubs." The guide, produced in Australia, and more commonly to be found in the rucksacks of backpackers in South East Asia, continues: "Probably best known around the world for its football team, the city that produced Oasis, Take that and Simply Red, is a grim monument to the industrial history of Britain". As a photographer, one piece of advice particularly caught my eye: "To those looking for picture-book packages, the answer is, don't". Elsewhere, it states: "To love the place requires a massive act of selective vision - but plenty of proud Mancunians manage it. The question for the traveller is: Why try?". I'll keep these thoughts in mind the next time I'm in Australia. The hot temperatures continued into the early part of the week, but by Thursday, the skies gradually became cloudier, but still with sunny spells. Yesterday and today there has been a mixture of sunshine and thundery showers. Temperatures around 20 degrees celsius, 70 fahrenheit.